This one was rather fun to paint - everything just seemed to work. 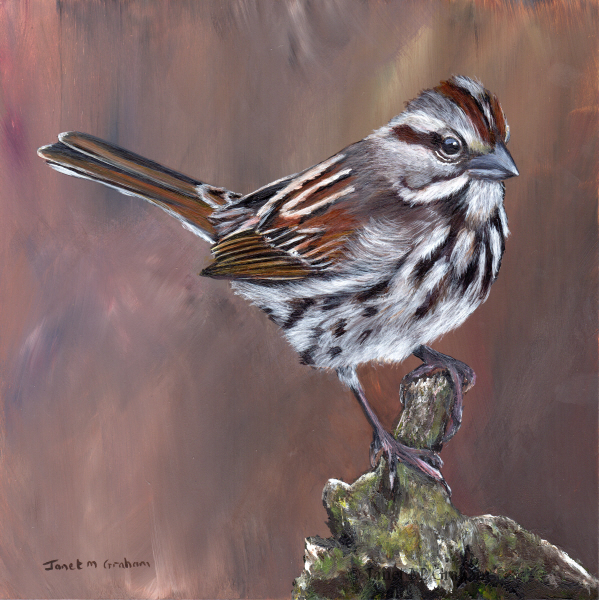 Swamp Sparrows are found across Eastern and Central North America. They measure around 12 - 14 cm in length and weigh between 11 - 24 grams. Swamp Sparrow measures 5 x 5 inches and is painted on Colourfix Smooth paper. Many thanks to Andy Reago & Chrissy McClarren for the reference photo. I love the feather colours of this one. Collared Sunbirds breed across must of Saharan Africa. They measure between 9 - 10 cm in length and weigh between 5 - 11 grams. 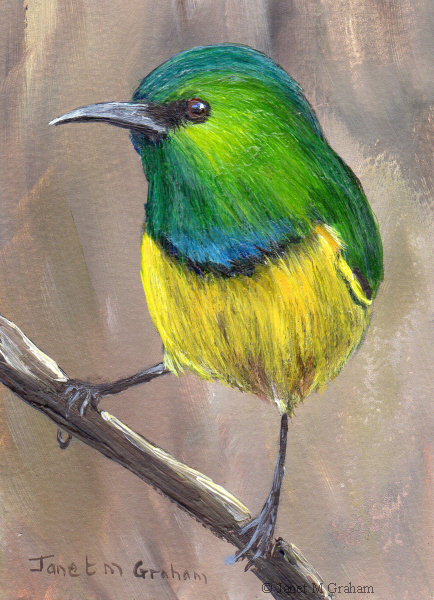 Collared Sunbird measures 2.5 x 3.5 inches and is painted on Colourfix Smooth paper. Many thanks to Brian Ralphs for the reference photo. I love the angle of this ones head. Acorn Woodpeckers are found in North and Central America. They measure between 35 - 43cm in length and weigh between 65 - 90 grams. 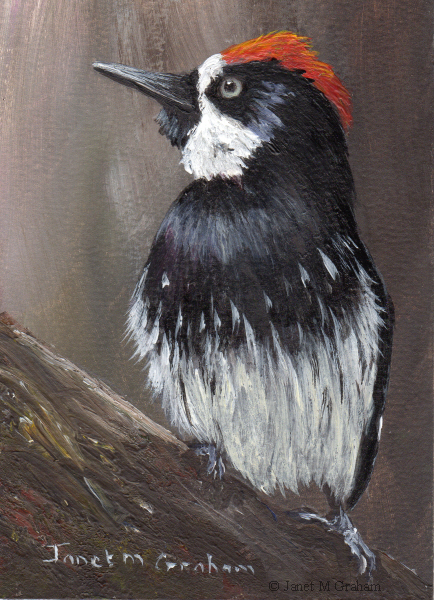 Acorn Woodpecker measures 2.5 x 3.5 inches and is painted on Colourfix Smooth paper. 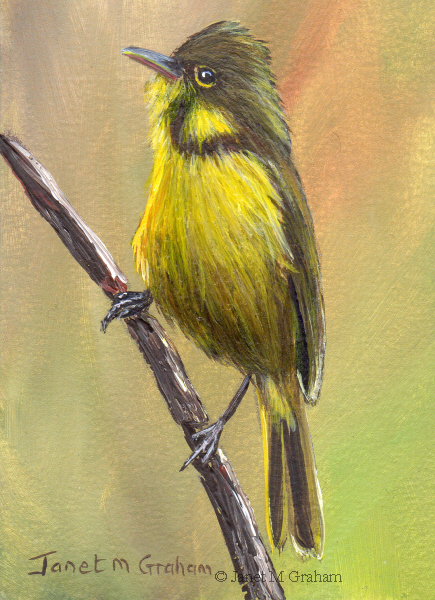 I love painting yellow feather so couldn't resist painting this one. Macgillivray's Warbler measures 5 x 5 inches and is painted on Colourfix Smooth paper. Many thanks to Alan Schmierer for the reference photo. I love how this one is perched on the branch. 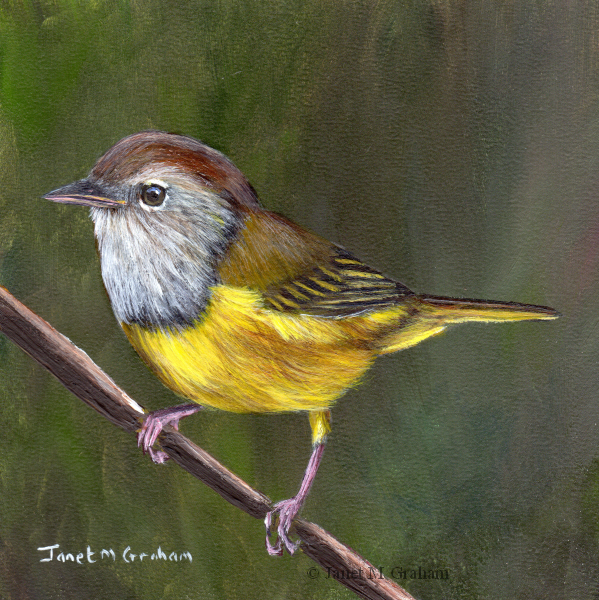 The African Yellow Warbler is found in Africa. It is also known as the Natal Yellow Warbler, dark capped warbler or yellow flycatcher warbler. They measure around 13 cm in length and weigh between 10 - 15 grams. Many thanks to Francesco Versonesi for the reference photo. 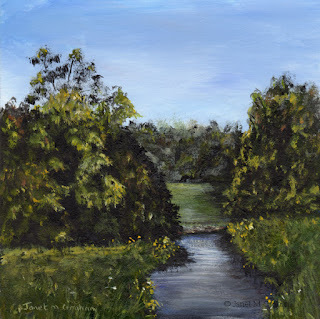 This one was rather fun to paint - everything just seemed to worked. White Browed Babblers are found in central and southern Australia. They measure between 17 - 21cm in length and weigh around 40 grams. Many thanks to Patrick Kavanagh for the reference photo. 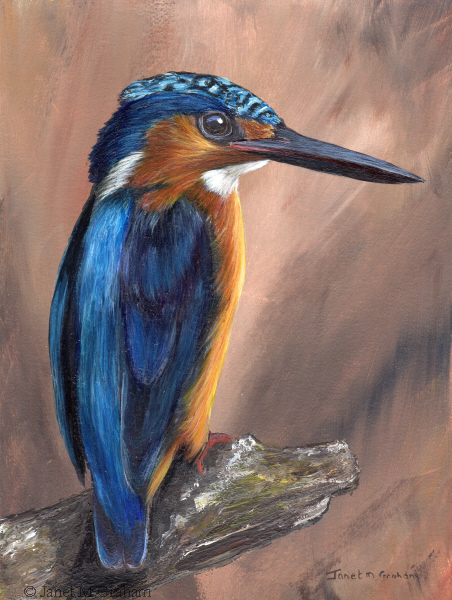 And of course I also had to try out the panel for a bird painting so decided to paint this one. Really love how I can blend the background colours and build up the layers. Song Sparrow measures 8 x 8 inches and is painted on Ampersand Smooth panel. When ordering some more paper from the Art shop I use, I noticed that they are now stocking Ampersand Panels. I have always wanted to try the Ampersand Smooth panels so decided to order a few. I love the surface of these panels - they are so smooth (much smoother than the gessobord panels) and the paint just glides on in a very similar way when using the Colourfix Smooth Paper. I will definitely will purchase a few more. 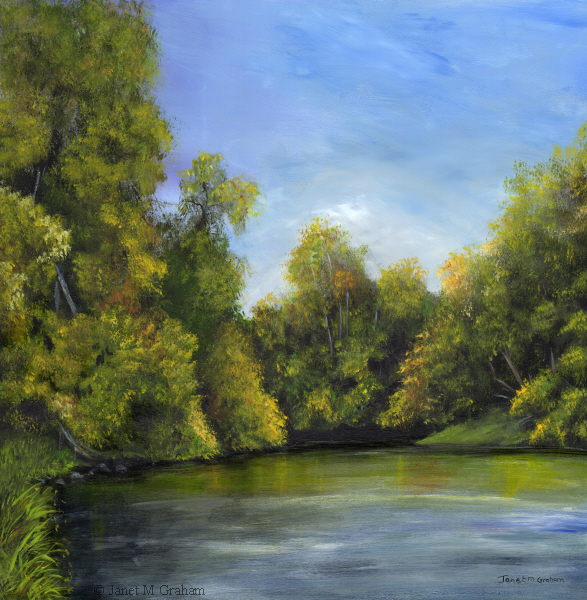 Spring River 2 measures 12 x 12 inches and is painted on Ampersand Smooth Panel. Many thanks to Galyna Lee for the reference photo. I love how this one is perching on the branch. 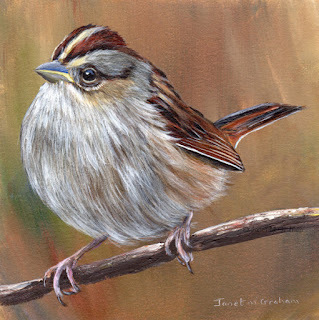 White Browed Sparrow Weavers are found throughout central and North Central Southern Africa. They measure between 17 - 19 cm in length and weigh between 31 - 59 grams. Many thanks to Francesco Veronesi for the reference photo. 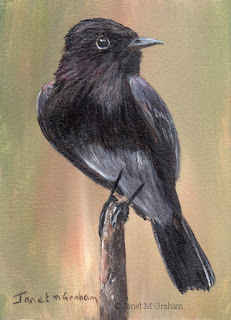 I felt like a bit of a challenge so decided to paint this lovely black bird. 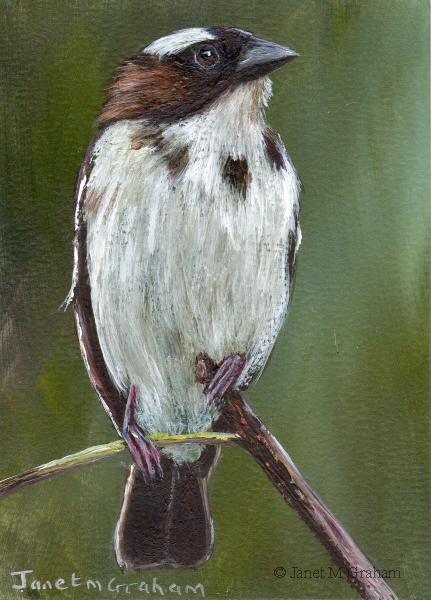 It always tricky painting black feather but with quite a few glazes , you can build up depth to the feathers. Really pleased with how it turned out. Black Phoebe's are found in North, Central and South America. They measure around 16 cm in length and weigh between 15 - 22 grams. Love how this one is perched on the branch. 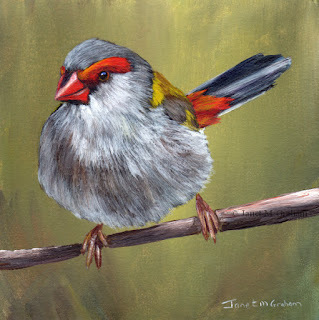 Red Browed Finch measures 5 x 5 inches and is painted on Colourfix Smooth Paper. Many thanks to Jim Bendon for the reference photo. For something a little bit different, I painted this little seascape scene. 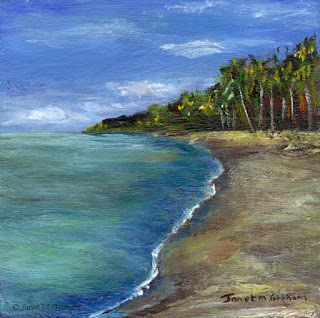 Tropical Beach measures 5 x 5 inches and is painted on Ampersand Gessobord Panel. Madagascar Kingfisher measures 6 x 8 inches and is painted on Colourfix Smooth paper. I love how this one is perched on the branch. Really pleased with how it turned out. 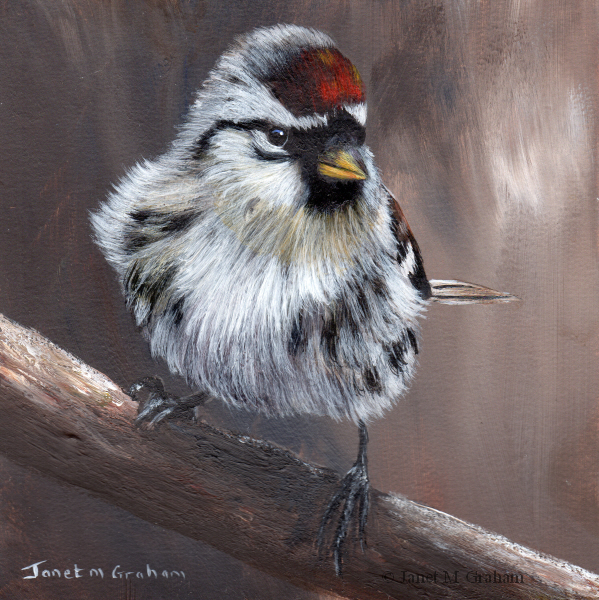 Common Redpoll measures 5 x 5 inches and is painted on Colourfix Smooth paper. Many thanks to David A Mitchell for the reference photo. 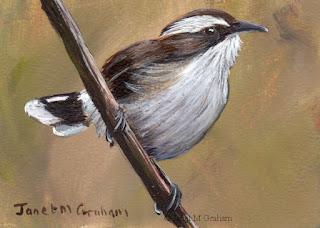 I love how this one is perched on the branch and the angle of its head. 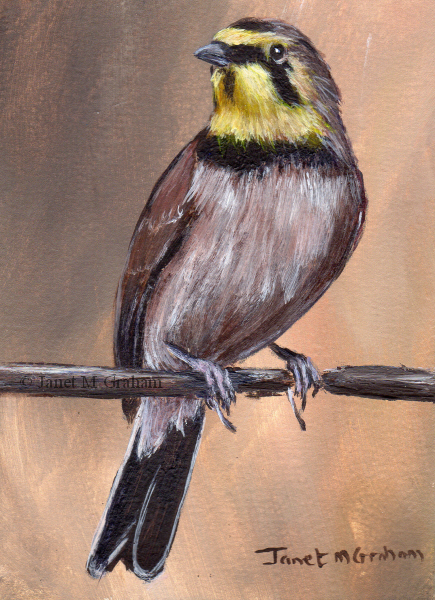 Horned Larks are found across the Northern Hemisphere. In Europe they are known as Shore Lark. They measure between 16 - 20 cm and weigh between 28 - 48 grams. Horned Lark measures 2.5 x 3.5 inches and is painted on Colourfix Smooth Paper. Pyrrhuloxia is a song bird found in North America. They measure around 21 cm length and weigh between 24 - 43 grams. 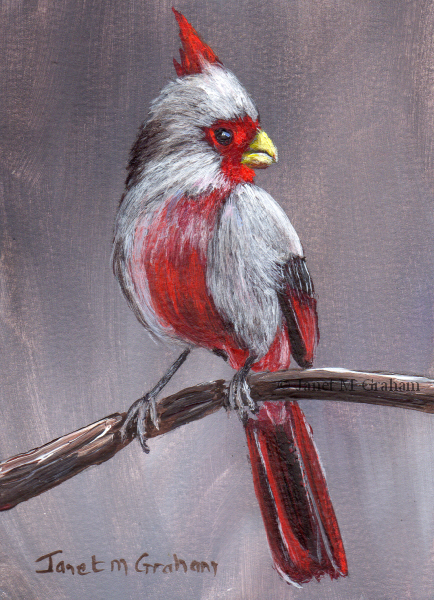 Pyrrhuloxia measures 2.5 x 3.5 inches and is painted on Colourfix Smooth paper. Meadow Stream measures 6 x 6 inches and is painted on Colourfix Smooth Paper. All artwork is copyright © Janet M Graham. All rights reserved. . Simple theme. Powered by Blogger.